Pizza begs to be photographed: the cheese! the circle-on-square composition! the asymmetrically sprinkled basil! If you’re looking to up your game and stop posting plastic, greasy-looking pizza shots all over your Insta, you could do a lot worse than this actually really solid guide to food photography from, of all places, Chicago-born deep dish chain Giordano’s. I have to imagine that the marketing employee behind this guide is either a) secretly pining for a photography career or b) just really sick of people’s crappy shots geotagged to Giordano’s. The guide starts off with some basics: Plan out your shot; make sure you’ve got good lighting. And from there, Giordano’s takes amateur ’grammers to school. Have you considered the golden ratio? Do you need backlighting? Are you sure the Lo-Fi filter is the best choice? Are you taking advantage of negative space? The post dives into everything from depth of field to contrast to color palettes. 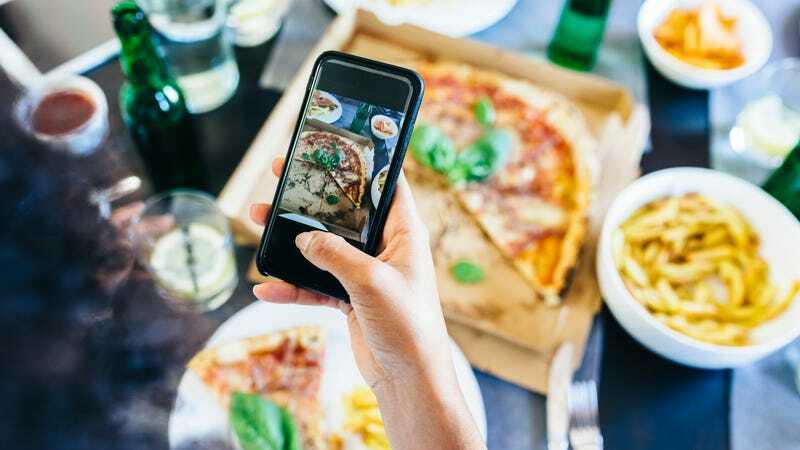 Of course, if you followed all this advice, you might end up spending 25 minutes arranging your Instagram before actually diving into your pizza, which can result in a cold-cheese catastrophe. So allow me to proffer The Takeout’s number one rule of food photography: Never let it get in the way of the actual food.